Now that’s too cute!! 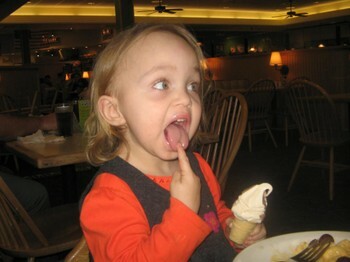 It’s like she is saying…”I know the ice cream goes right here! !” LOL What a cutie pie!! My WW is up! Happy Wednesday! It does look like that. She was actually just using her finger for a first, tentative taste test. She is veerrrryyy cautious about new foods. Wow, at my house that sign means, “There’s a hair in my mouth and I’m going to throw up.” We see that gesture once or twice a month. My kids have loose valves, though. I’m glad this was a happy occasion, and the food was going IN! She’s AWFULLY cute! Wait, she’s not doing the gag sign, right? I don’t know any kid – or anyone – that doesn’t like ice cream, lol! Cute little bugger! Was she telling you that she was eating the ice cream? Thanks for coming by my WW. I so missed this yesterday. I love it. Must have been a kid theme and I missed the memo. I did a flower. I like this one.